Discussion in 'Roadster' started by doug, Dec 15, 2008. 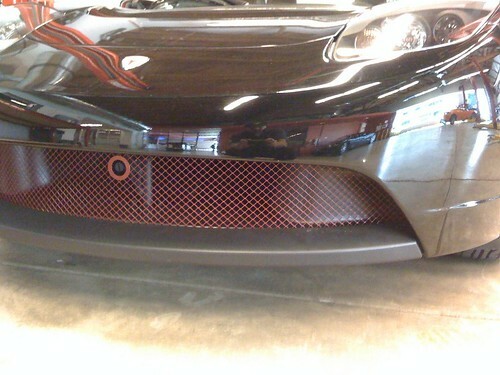 Not sure I like the red on the grille like that. I would have to see it in person I suppose. Is this a car still in Menlo Park with no drive train? I wonder whose car it is? I just find it and pass it along. The pics were posted by Bob in the LA store. 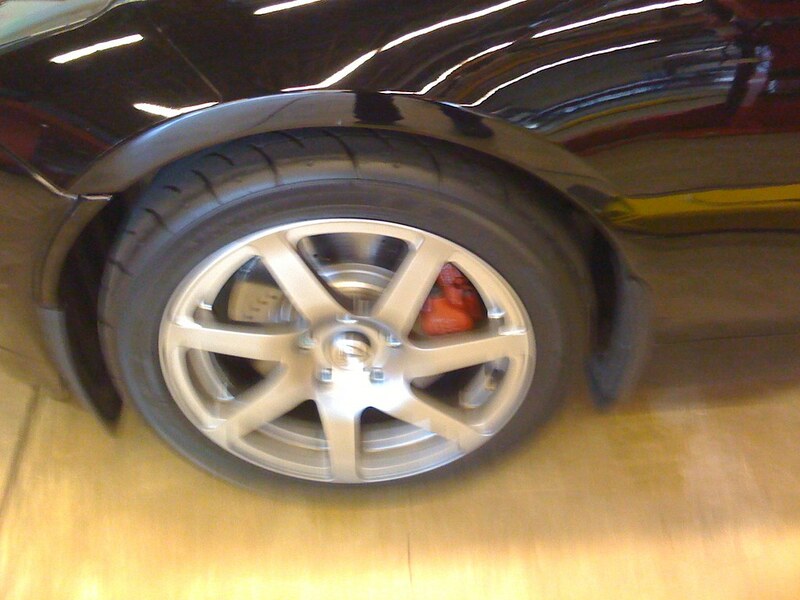 I think those are the A048 (sport) tires as well. By the way, you can see the photographer (who I recognize, wearing a Tesla hat) in the reflection on the Roadster quarter panel in the photo Doug posted. And you can see the building across the street from the LA storefront in the reflection above him which you can also see in this nighttime shot of the store. By the way, you can see the photographer (who I recognize, wearing a Tesla hat) in the reflection. You must have really good eye sight cause I can't see any person in a reflection. Where exactly are you seeing this in the picture? Mods on Flickr - Photo Sharing! Thanks doug, didn't realize it was another photo TEG was referring to. Done by Al and Eds Autosound. I like DrTaras (from reading his postings) but I am not a fan of those changes. Does it look better in person? The pictures of #254 are not impressive. Styling is a personal preference for sure. What it does do is bring up the general quality of the interior to high quality materials and finish. I'll pass on 90+% of these changes as well. Amusing to hear that he says that it's going back to get truly pimped out soon. Love to see what can be done though. If I were so inclined I would go with another seat entirely (and lose the pattern), although I'm sure the options are limited, as the space is a cramped one. I would also stick with a continuity of surfaces (either all CF, all brushed aluminum, all chrome, etc.) as the mixture is not to my taste. Since it exceeds the Roadsters accessory 12V current rating, the sound system required a separate 12V supply which has to be charged (again separately) via that plug under the rear diffuser. The video shows the sealed lead acid battery where the stock subwoofer would be and the 120VAC to 12VDC inverter mounted behind the rear grill.